ZÜCA Beachy Blue Insert & Frame. An ocean in motion for tons of breezy fun. 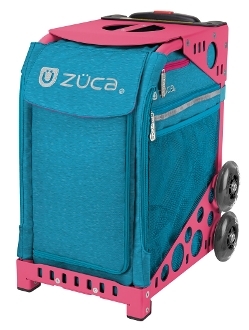 ZÜCA bags are great for kids on competitive sports teams. You can use them to haul all your gear and you can sit on them when seating is limited at competitions. Can also be used as weekender bags when you purchase the Pro Packing Pouches. The optional Pro Packing Pouch Set includes five packing pouches of various sizes and a one quart TSA compliant toiletry bag to help you pack like a pro. The Pro Packing Pouch Set fits both the ZUCA Pro and the ZUCA Sport. Handel telescopes to a height of 39.5 inches. The dual wheel system climbs stairs and curbs with ease. Magneto dynamic 4" polyurethane wheels absorb shock and make for a seriously silent ride. Feet, made of nylon 6, go easy on scratchable surfaces. Weight Frame and Bag is 9.4 lbs. Optional Seat Cushion is available! Option Stuff Sack is available. Stuff all of your extras into this handy little sack! It slides over the handle on your ZÜCA so you can tote your extra stuff around town. Made of ripstop nylon, you will be amazed at how strong this bag is and you can easily carry it in a pocket when not in use. Please note that this carrier is NOT for airline use. Warranty covers defects in materials and craftsmanship for up to 1 year. ZÜCA's are completely washable and serviceable. Close all Velcro straps and hand wash your ZÜCA Sport insert bag in cold water with a mild detergent and air-dry.